This page shows the dividends I will receive every month and my progress vs my goals. The table below is synchronized with my portfolio page. I update the table when I update the portfolio page, which happens around the middle of every month. Some months have more dividend paying stocks than others since different companies have different payment dates. Dividends are the backbone of my wealth building strategy. Dividends are cash in my pocket that I can use to purchase even more companies that can pay even more dividends. In effect money brings in more money and this snowball continues. I expect these dividends to grow on their own without any additional contribution from my part, at an average annual rate of 6% to 9% and an average yield of 2.5% for a total income growth of 8% to 11% per year. The dividend reinvestment into company shares from dividend payments and the annual growth in all of my companies' dividends allow for a double compounding effect that greatly increases one's wealth over the span of many years. 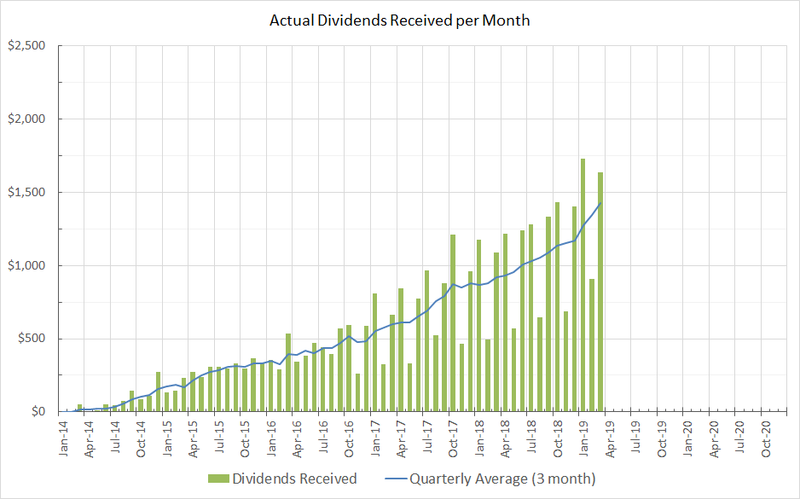 Although the dividend payments below may seem puny at first in the beginning, my monthly dividends are already getting above $1000 now (~2018 period). I expect these monthly payments to roll up to $2,000 - $3,000 a month by the time I am in my 30's and then snowball on their own as I get older. The below table shows the 2019 summary. It covers all stocks except Xcel Energy, I guess. Keep on investing. I am sure you'll make your million as you want to.